Alhambra, CA - Friday, August 30, 2013 was the first day of the Jubilee Celebration of the Western American Diocese: Freedom to Pursue the Faith. This year during Diocesan Days we acknowledge several momentous anniversaries: 50 years of the founding of the Diocese, 150 years of the birth of Archimandrite Sebastian Dabovich, Holy Apostle to the Americas, and 1700 years of the Edict of Milan. On this first day of Diocesan Days, all of our clergy from throughout our Diocese gathered together for a luncheon followed by a special Clergy Siminar with guest speaker Rev. Dr. John Erickson of St. Vladimir's Seminary. 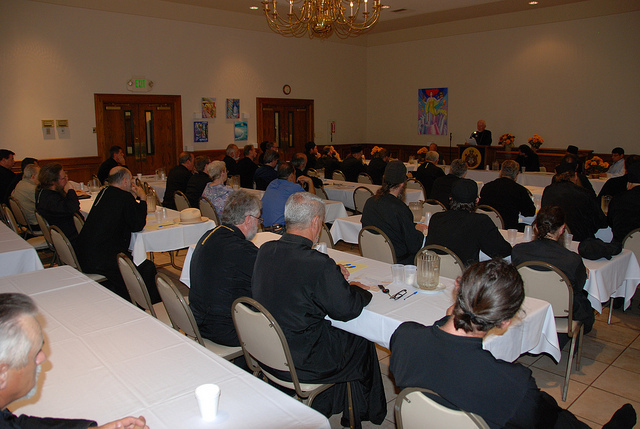 Later in the day, the Diocesan Council held it's annual meeting in preparation for the Annual Assembly. At the same time, the Diocesan Kolo Sprpskih Sestara held it's Annual Meeting with ladies from KSS organizations from churches throughout the diocese. The meetings concluded at 6pm and were followed by Great Verspers and then dinner in the pavilion. After dinner presentations were given by V. Rev. Dr. John Erickson and Hieromonk Iakovos of Simonopetra, Mt. Athos and then a question and answer period.